Album Review: A Different Kind of Truth By Van Halen | Errols Weekly Music Update. 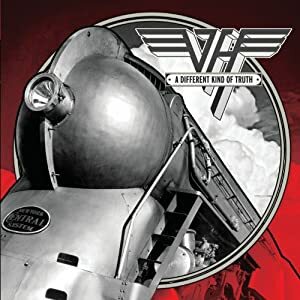 Album Review: “A Different Kind of Truth” by Van Halen released on Feb. 7, 2012. Update: I want to take the opportunity to say that in no way did I mean to disparage Michael Anthony’s contributions to Van Halen- just the opposite- his vocals and bass playing were second to none. I guess I let my frustration about people not getting on board with this version of Van Halen because the backing vocals were not as good now, I totally get it. But again, this is as close to the version that the die-hard Van Halen fan knows is the only one that they want. I love the Hagar years as well but there is something about the Diamond Dave years (and hopefully years to come) that is the most special. So admittedly the backing vocals do take a hit but again I think more from a live perspective than anything else. Van Halen is back and yes there has been some shuffling of the members but if you were a fan of this Hall of Fame band back in the late 1970’s and early 1980’s like I was, then you know that this is what Van Halen is supposed to be. Ok, yes it does seem unfair that Michael Anthony is not here with his “brothers,”- I get it. However, they “kept it in the family” and brought in their son/nephew –“Wolfie”-and now the already powerful steam engine of Eddie and Alex has received a new sparkplug. Can you find me a family trio who posses more musical talent than the Van Halen’s? Let me ask you this- have you ever heard of a family asking a non-relative tenant to move from its apartment because the landlord’s “kin folk” needs a place to live? (I thought so) Now with respect to Diamond Dave- again if you are a core Van Halen fan- there is no one better suited to be the vocalist than him and we all know it. I’ll ask another question- has anyone out there ever been in a squabble with a family member? (I thought so). So now this revised unit has put forth its best effort to release “A Different Kind of Truth” and maybe it’s me but a lot of what I have seen so far is negative comments coming in every direction from the professional “critic” down to the surly I-Tune reviewers who probably have only listened to the one minute and thirty second sample of the songs and easily dismiss the effort. Hence, I am hear to address the complaints on behalf of “generation X’ers” who probably don’t even know these criticism’s exist (nor do they probably care) and probably wouldn’t take to the web like I am to defend (can’t believe I just said that) this legendary band. First, I will refer you to this notion that a band can’t use riffs or licks that may have been done a while back but never made it out of the vault. Hmmm… is it me or has there been multiple releases of Tupac material since his unfortunate death or “new” Beatle songs despite both John and George not being around? Name one band or artist that sounds totally different from one album to the next? It’s hard to do, isn’t it? Second, I need to address the perception that the background vocals have taken a huge hit since Michael is no longer in the band. Seriously? With all the technological advances that the music industry has made for making most anyone’s voice sound professional, (see Milli Vanilli) don’t you think they can make the same type of vocal sound which appeared on every Roth led album prior to this effort? I defy you to point out Michael Anthony’s vocals in any of their first six records that he was on and tell me you hear a difference on “Different Kind of Truth.” It’s probably more apparent at the live shows than on recordings. Anyways, if that’s your beef then you are just picking at straws. Third, David Lee Roth’s vocals are not as good as it was before. Well yeah what do you expect 28 years later? However, we are not talking a huge drop-off-admittedly he can’t hit the same high notes/screeches as he did when he was in his 20’s but can Brian Johnson from AC/DC reach the same tone now as he did on “Back in Black?” What the Diamond man brings to the table as a showman more than makes up for the moderate range decline and he just flat-out exudes “coolness!” Is there anyone more comfortable in his shoes than Mr. Roth? He interjects his naturally timed “talking moments” inside so many songs (see “As Is”) like no other rock singer has ever done. And for someone who is now closing in on his 60th birthday, I guarantee you he is in better shape than most who are at least 25 years younger. His moves are effortless and to this day there has never been a more acrobatic front man. Now with all that out of the way (there is more but I need to move on) I will say that “A Different Kind of Truth” is a good album- I would give it a three-star rating out of the typical ceiling of five stars. The more you turn it over, the more it will grow on you. The first thing that will instantly hit you is the incredible guitar playing by Eddie- he hasn’t lost a thing- there are so many blistering moments here that I believe there will be some who will think (and they wouldn’t be wrong) that this is his heaviest moment ever in Van Halen, any rendition of Van Halen. At every step of the way is his brother matching his brother’s scorching riffs with his thunderous pounding of the skins (always seems like there are at least two other drummers on the recordings helping him make that sound) which solidifies his position as one of the all-time great drummers in modern rock history. Then on to Wolfie- if you learn from the best don’t you think he is going to be great? I guarantee you that even though he is young, he pushes his father and uncle to another level and not just because of the excitement of having your own offspring in the same band but because of his talent he possesses already (and you know will only get better as he gets older). Finally what else can I say about David Lee Roth? Like I said, his screams are not as high as they were on “VH II” but again he more than makes up for it with his experience. I would equate it to like being Randy Johnson, the former major league pitcher, who in his younger days could sling it faster than most anyone on the planet and when he “seasoned” he learned how to pitch. That’s what Dave does here- he may not be able to blow you away with his fastball but he can definitely put it under your chin and make you stand up and take notice. It’s impossible to not know when David Lee Roth is in a room and he is all over the room on this album- it is the “truth.” There are some “instant classics” on this album (see “Outta Space” and “Big River”) which is worth the price of admission. Now I’m not going to sit here and tell you that it’s as good as their debut or VH II but for those out there who scoff at Diver Down, then maybe this is your album. Ok well you already know how I feel about Tattoo, it’s really not as bad as everyone is making it seem- I love the chorus- “swap meet Sally…tramp stamp tat.” Moving on. Track # 2-“She’s The Woman”- picks up the edge and pace while conjuring up images of the early 1980’s when this band was at the top of the world. There really can’t be any complaints here, right? I love the line-“Got a door bell sign says bring it or don’t ring it!” Listen carefully to Eddie throughout his rollercoaster ride with the way the guitar works the entire thrill while Alex is letting the world know that he means business. The song is short but packs a powerful punch. “You and Your Blues” actually starts off like a Hagar led song but quickly turns back to Roth leading the party. I will point you in the direction of the background vocals on this track and tell me you hear something really missing. This is a bluesy type of track with glimpses of muscle guitar while the groove accelerates at certain points but then comes back down to the calm of a spring morning. “China Town” starts off with a guitar sound similar to Skrillex and then quickly turns into a head-banging affair with Alex, Wolf and Eddie leading the charge as the engine starts to roar. As I listen I am kind of shocked at the heaviness of the song and when Eddie bursts into his solo it is the equivalent to someone knocking down a closed door with a massive kick. Wow the first four songs have blown by and the door is already off the hinges. Now with “Stay Frosty” most will probably head to hit the “skip” or “next” button on whatever system they listen to this album, but give it a chance. I know the beginning is tough and if you can get by all the “uhh ahh uhh’s” by Diamond Dave and focus on the groove after it picks up you will be blown away again by Eddie’s expertise on the guitar-just incredible. My wife said she didn’t know what “stay frosty” means and I had no answer for her, anyway the musicianship is so friggin’ tight and you will be air-guitaring in no time. “Big River” is an instant classic in my opinion as this incorporates every aspect of that “vintage Van Halen” that we all have grown to love. The bridge where Dave says –“look both ways now”- kicks it into overdrive as Eddie takes the wheel and the smoke coming from underneath the screeching tires will leave a mark as the blazing guitar riffs are spellbinding. This could have appeared on VH1 or VH2, ‘nuff said!! The album ends on a decent track called –“Beats Workin’”- it sort of reminds me of “Somebody Get Me a Doctor” (but not as good as that track). Dave seems to be trying too hard on this one as he seems to be screaming throughout much of the song and tries to stay at a high tone pitch that he could have easily hit years ago. The rest of the Van Halen’s musicianship keeps you holding on and again not a bad song but not one of their best efforts. “A Different Kind of Truth” is like a classic 1970’s Ford Mustang car that sits with a perfectly fitted cover in the garage for the most part but any time you take it out for a ride the shiny chrome grabs the attention of car lover’s and even those who are not. The car can still kick it into gear every once in a while and “spin-out” at the end of a vacant street and you think “wow what a car” but maybe stalls at the next Stop sign but no one is there to witness that occurrence; so you jump out and clear out the cob webs from underneath the hood and slam the it down for extra coolness and pray that it starts up again. Not surprisingly you make it home and before you put it back in the garage you wax it down for all the neighbors to see before you put that cover back on it. And just like that old neighbor would say to you-“Get away from that car”- because it’s a classic. Same with Van Halen- you know it’s a classic and there’s no reason to nit pick when the majority of the body of work is extraordinary. My advice is to take “A Different Kind of Truth” out for a spin every now and then. You and your neighbors will have a grin from ear to ear. in the day! Gonna download that one for sure!